This building has a secret past. It was built in 1922 by the Order of Owls, a secret society fond of rituals and fanciful titles (they called their lodges “nests”). A real estate description noted the two-story 21,000-square-foot lodge hall contained a basement bowling alley with fully equipped tavern. The first floor featured a 57 x 74-foot meeting hall with kitchen, wardrobe rooms, and two bar rooms. The second floor had offices, another kitchen, and two additional meeting halls — both of which were equipped with bars for a total of five in one building. “The newspaper paragraphers have a sound basis in fact for their threadbare joke about the man who cannot find his latch-key hole when he reaches home after the lodge banquet,” commented W.S. Harwood in a May 1897 article in the North American Review. 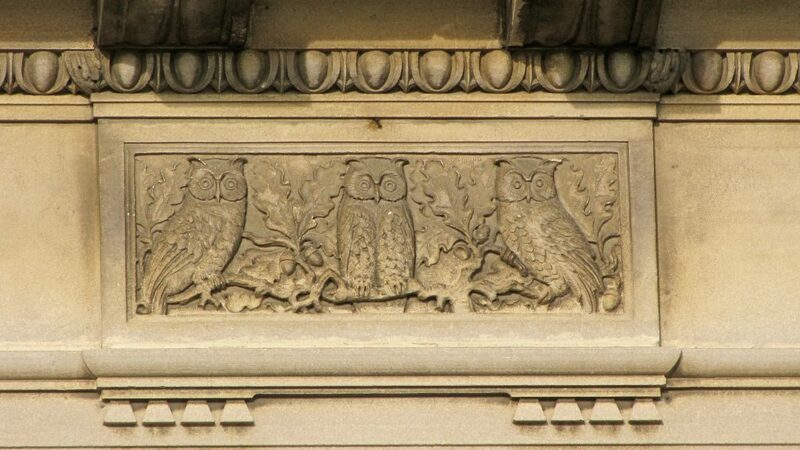 The Order of Owls, whose thirsty members built this nest, took wing in 1904, as a result of a philosophical discussion between a group of friends in South Bend, Indiana. “Out in Indiana,” wrote Frank L. Nelson, in the April 1912 edition of The Hampton Magazine, “when three or four men get together they are very apt to organize a secret society with benevolent features attached. As a beneficiary secret society, the Owls collected dues from members, 50 cents a month in 1918 plus a $25 initiation fee, and in return provided financial assistance to Owls in need. A sick or injured member received $6 a week — adjusted for inflation that would be about $107 today — plus the services of a physician at no charge. There was also $100 death benefit ($1,800 today). At a time when commercial insurance was poorly regulated, benevolent societies were immensely popular. Fraternal organizations offered more than insurance. Your lodge assisted you in finding employment if you needed a job. If you owned a business, lodge brothers would shop at your store and not at your competitors (“Owls trade with each other,” a 1918 newspaper advertisement bluntly declared). And, most of all, the convivial gang at the lodge hall soon became friends. Secrecy defined these organizations. The signs and tokens, the elaborate ceremonies and solemn oaths, were only known to their members. The Owls offered advancement through four levels — degrees — of membership. Recruits memorized the secret rituals, signs, grips and passwords and completed the initiation ceremony by reciting lengthy vows of faithfulness. The initiation was designed to be impressive. On one occasion it ended badly. In 1909, Milwaukeean E.W. Walker sued a Milwaukee Nest for injuries he sustained during his initiation. It was all in good fun, but Walker wasn’t laughing. He suffered injuries that left him bedridden for three weeks and unable to work for two months. The woman testified that Talbot, an acquaintance of her father, invited her to visit South Bend on her vacation. On her arrival, she told a grand jury, she was made a virtual prisoner. She eventually escaped and notified the South Bend police. The legal troubles of its national president didn’t slow the organization’s rapid growth. On Sunday, Dec. 10, 1922, the cornerstone was placed and the North Side Nest, No. 1818, Order of Owls, was dedicated at its site near the intersection of Green Bay Avenue and Port Washington Road. 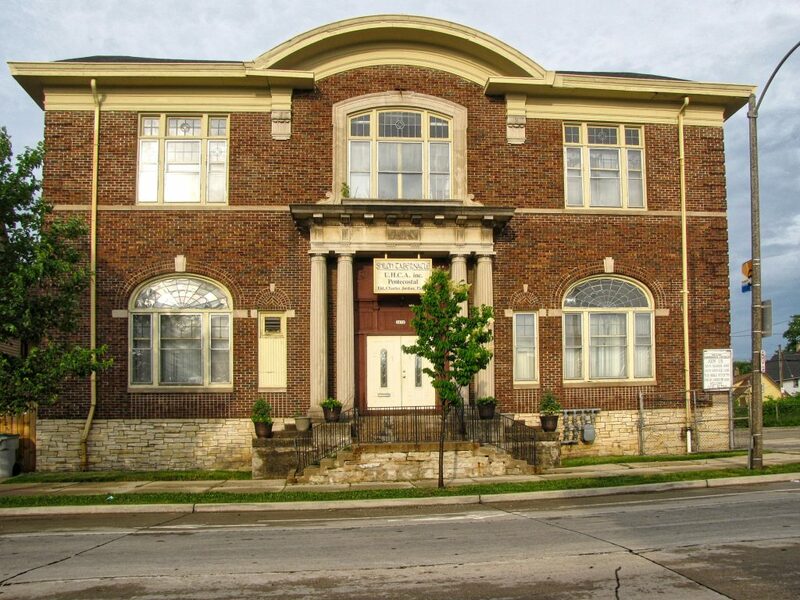 By 1924 the Order had 643,748 members in 2,148 lodges, and its new North Side Nest, one of five in the Milwaukee area, was part of the fabric of the neighborhood. That year, the nest hosted a Christmas party for nearly 1,000 children. After an afternoon of singing and dancing, each child went home with a gift. In 1927, the Milwaukee Journal reported, the North Side Nest initiated a class of 500 new members. But trouble was brewing behind the scenes. Just two year later a number of members voted to leave the Owls and form the Fraternal Order of Pilgrims with national headquarters in Milwaukee. Dissatisfaction with the management of the national executives of the Owls and internal strife caused many Milwaukeeans to withdraw from the lodge, Arthur Woehrle, secretary of the Pilgrims said in an article in the Nov. 14, 1929, Milwaukee Journal. He also said the Owls had not held a national convention since 1906 and paid little attention to the concerns of individual lodges. After filing articles of incorporation and composing an elaborate and, of course, secret ritual, the founders held an election to fill the newly created posts of supreme sovereign master, supreme senior master, supreme junior master, supreme chaplain, supreme marshal, supreme inner guard, supreme outer guard, and supreme secretary. With so many Milwaukee Owls flocking to the new organization, the Pilgrims were able to take control of the big brick building on Green Bay Road, and rename it Pilgrim’s Club No. 1. New members promised faithful service to fellow members, loyalty to the order, and vowed to promote harmony and cooperation for mutual advancement. By 1930, the Pilgrims had 11 chapters with 5,000 members in Wisconsin. Three years later membership topped 9,000. But the tide was already turning against fraternalism. In the decades following World War II, the Pilgrims began to fade. In his 2000 book, Bowling Alone: The Collapse and Revival of American Community, author Robert Putnam connects the decline of fraternal societies in the 20th century to a general collapse of social institutions that served to link individuals to neighbors and communities. Eventually, the Pilgrims placed their fine clubhouse on the market, and in time it found a new owner, Shiloh Tabernacle Church, which has become just as important to this neighborhood as the Owls and Pilgrims had been. The Owls built their Nest and built it to last. The big brick building looks as solid as ever nearly a century later. But the Owls, like so many fraternal organizations of their time, restricted membership to whites only. Shiloh Tabernacle is a predominately African-American congregation. There’s so much bad in the best of us / And so much good in the worst of us / It hardly behooves any of us / To speak ill of the rest of us. Wonderful article. I’ve always admired the building when I drove by, and often wondered about the owls and the spiderweb windows. Thank you so much.